Phoronopsis harmeri is a member of Phoronida, a relatively small phylum of sessile, tube-building marine worms. Phoronids release sperm in packets called spermatophores, which probably drift in water currents before landing on the lophophore of another individual. In P. harmeri and some other species, these spermatophores are equipped with a mucoid spiral “sail” (Zimmer 1997). The spermatophore of P. harmeri, sail included, is pictured here. There is some controversy regarding the early cleavage pattern of phoronids. While some researchers have reported radial cleavage, others have reported spiral cleavage, biradial cleavage, and “derived spiral” cleavage (reviewed by Pennerstorfer and Scholtz, 2012). In spiral cleavage, the blastomeres of the early embryo divide along a plane that is oblique to the animal-vegetal (A/V) axis, and the cells are not stacked directly on top of each other but are offset from one another. In contrast, blastomeres undergoing typical radial cleavage divide either parallel or perpendicular to the A/V axis, and the cells stack directly on top of one another (Ruppert et al. 2004). Pennerstorfer and Scholtz (2012) quantified the number of embryos exhibiting spiral-like cleavage in Phoronis muelleri and the degree of tilt of the plane of division. 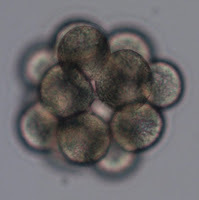 They concluded that, beginning with the third cleavage, early cell division in P. muelleri tends to occur in a spiral pattern, although there is a high amount of variability among embryos of this species. Pictured at left are examples of the 8-cell and 16-cell stage of P. harmeri, whose early development I observed while taking the Embryology course at OIMB. 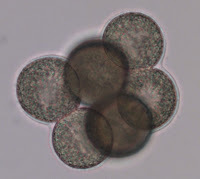 The sister cells in the 8-cell embryo (side view) appear to be nearly on top of one another, so the third cleavage (at least in some embryos) of this species is not obviously spiral. However, the four polar blastomeres in the 16-cell stage pictured here are noticeably offset from their four sisters, though not every embryo in our class culture looked like this at the 16-cell stage. At least some embryos in this culture exhibited alternating (dextral vs. sinistral) divisions (S. Maslakova, pers. comm. ), as in typical spiralians. Is early development in P. harmeri also somewhat spiral? Pennerstorfer. M. and Scholtz, G. 2012. Early cleavage in Phoronis muelleri (Phoronida) displays spiral features.Evolution and Development. 14(6): 484-500. Rupert, E., Fox, R., and Barnes, R. 2004. Invertebrate Zoology: A Functional Evolutionary Approach. 7 ed. Brooks/Cole. Zimmer, R. 1997. Phoronids, Brachiopods, and Bryozoans: The Lophophorates. In Embryology: Constructing the Organism. Gilbert, S. and Raunio, A. Eds. Sinauer Associates, Inc. Sunderland, MA.